“What if…?” questions are a powerful way in which anxious individuals generate or maintain anxious states, particularly in generalized anxiety disorder (GAD). What If…? 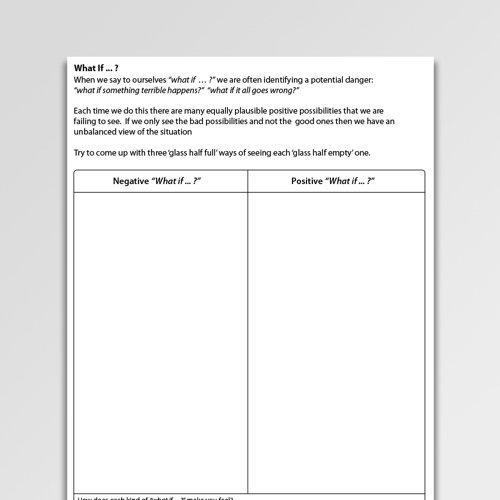 is a worksheet for identifying and challenging “what if … ?” cognitions. “What if…?” questions are a powerful way in which anxious individuals generate or maintain anxious states. Asking oneself a “what if…?” questions invites an individual to worry about low-probability / high-consequence possibilities – to catastrophize. What If…? 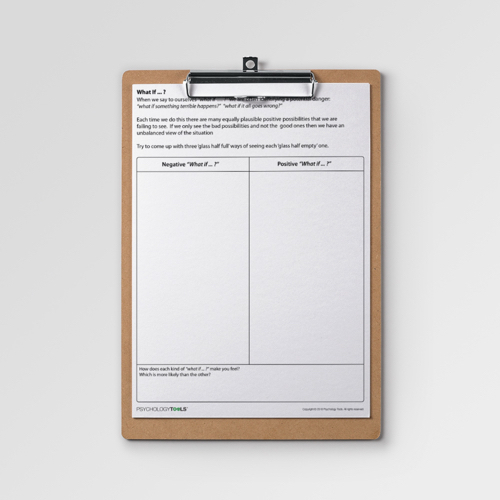 is a worksheet for identifying and challenging “what if … ?” cognitions. 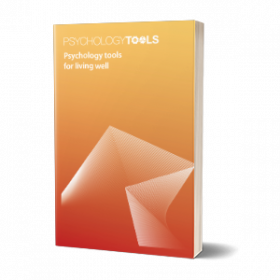 It contains elements of psychoeducation, threat identification, and cognitive restructuring. 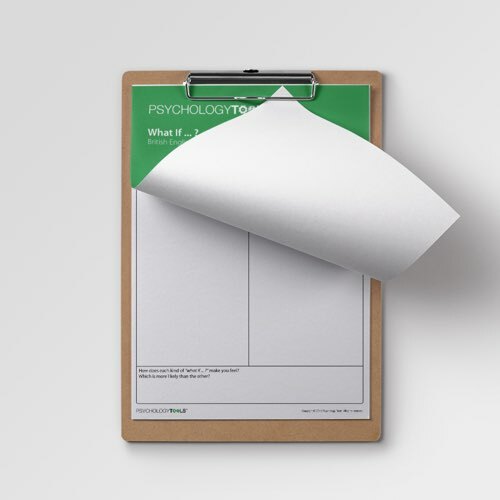 This worksheet presupposes that anxious “what if…?” thinking is a biased form of cognition in which an individual selectively attends to possibilities with negative consequences. This can be framed as a habitual (but inaccurate) form of thinking. 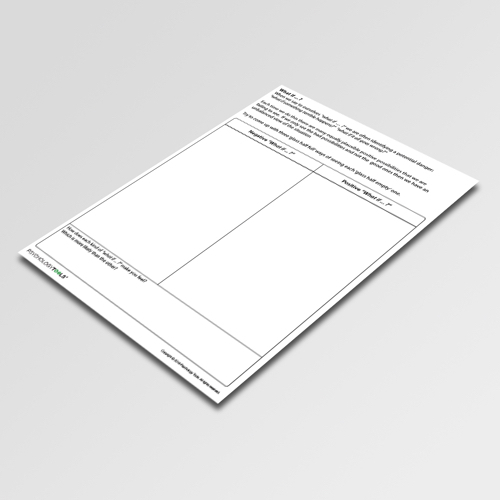 Using this worksheet clients are invited to counter their biased thinking by delierately attending to positive as well as negative consequences of a situation / event. For every negative “what if…?” thought clients should be encouraged to generate three positive “what if…?” alternatives. Davey, G. C., & Levy, S. (1998). Catastrophic worrying: Personal inadequacy and a perseverative iterative style as features of the catastrophizing process. Journal of Abnormal Psychology, 107(4), 576. Vasey, M. W., & Borkovec, T. D. (1992). A catastrophizing assessment of worrisome thoughts. Cognitive Therapy and Research, 16(5), 505-520.